With only 7,500 miles on our nearly new CR-V my family and I were left stranded on the freeway in March of last year. The check engine light came on at 75 MPH and we lost all power...could only limp along the berm helplessly. After finding a safe place to park I checked the engine oil only to notice that I gained about a quart of gas-infused oil. Over a year later I've been to the dealership three separate times for the same issue, including one visit for a dubiously termed "software upgrade". Today I noticed a pronounced gasoline smell in the cabin at start-up, and once again found about a quart of extra oil....or should I say parts de-greasing fluid, churning around in the crankcase. I'm done. No more games with the dealership. The only acceptable solution is a new engine or a full refund. Made a Toyota fan from this once loyal Honda owner. Less than a year after we bought the car I read a report about the Honda 1.5L turbo engines having oil dilution problems. When I checked the oil level it was much higher with gasoline smell just as others had been reporting. We took it in to the dealership and they changed the oil for free and did the required software update to fix the issue. After around a month when I checked the oil the level again was much higher and the issue had not been fixed. We live in San Diego and we do not do short commutes. We usually go on the freeway which should heat up the engine enough to avoid this problem. The Honda dealership said that high oil levels and oil dilution is normal for this engine and not to be concerned. The car drives fine but the long term reliability of the engine is a big concern since high oil dilution should not be normal. This should affect the durability of the engine since it doesn't get proper lubrication. It looks like they haven't found a real solution or they are not willing to fix it because of the expense. Some oil dilution is normal but not to this extent. I really hope Honda corrects this issue soon and extends the warranty otherwise they will lose the trust of their current customers and future ones. Hello people thanks for this site. I am smarter than the average bear so when I got the "recall" notice--engine light -a/c compressor re-program couldn't see a correlation. Brought car in yesterday. Oil level too high. Re-program of a/c compressor done and free oil change performed. I asked service rep what's the deal? He flat out lied and stated it only affected " The Asian market vehicles- like Honda's sold in China". Soooo, why the problem here and the need to fix it and the contaminated crankcase oil ?? Service tech had a blank expression on his face like a witness caught lying under oath. We, as other kind posters here: intended this to be our last car for the foreseeable future. We have only logged 7500 miles on this vehicle in 1 year. We are in NY. and it takes 15 minutes to get the air to blow warm. THIS IS A SHAM BALONEY FIX! Honda wants our vehicles to throw the compressor on , to increase engine speed to warm engine faster to fix the problem? Why not duct tape? To the poster who was 1 liter high on the oil level because of gasoline contamination: 1 liter on a 4 liter capacity is REAL serious add to that the oil weight of 0-20 you are washing the engine not lubricating. We have short and long term problems ahead. I am checking the oil level weekly. will update. I found this site because the front seat started fraying badly at 2000 miles, another rant , another day.Thanks everyone. We have to make a collective stink as our vehicles are in jeopardy. My 2018 Honda CRV started to smoke, had no get up and go and it started to smell like rotten eggs. Call Honda to come and tow it in. Told them I would not drive it this way. We got a letter the week before about a recall and the engine light went on a couple of day before I called and they told me that was because it was a year since we bought it. Now they start telling me it is because of the catalytic converter has gone bad. I said they are made to go for the life of the car. I am told they are also going to fix that and do some software update. I got the car back on Friday and started to look over the things they fixed. There was a note in there that said that the oil was 2 inches over the full mark on the dip stick. Then I started asking a lot of questions because we bought a 2017 Honda Civic from the a little over a year ago and the same thing happened. We told them that we wanted a different car that didn't have that problem and that is when we got the CRV. I found out they both had the same engine at the time that the Civic had the problem. They told me they never had that problem before,it was a fluke that that happened and that that would not happened with the CRV. So now I have to worry if I got a real lemon from Honda and how much damage is done to my engine driving with all that oil and gas mixed in the crank case. Terrible gas smell in the cabin. Smells like an open gas container in the vehicle. Googled to see if anyone else has experienced this issue and read about gas mixing with the oil. Once we got home I checked the oil. 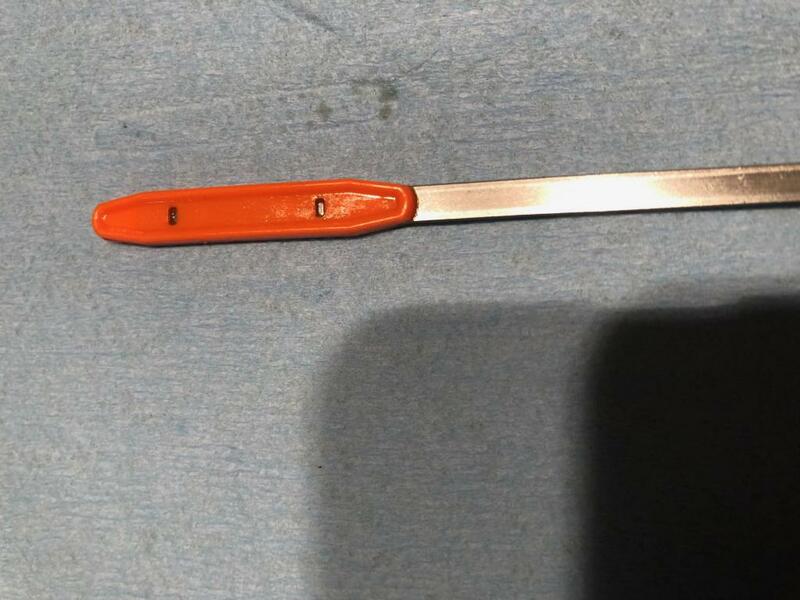 Very strong gas smell coming from oil dipstick. Plan to contact Honda and the dealership tomorrow to see what can be done. Concerned about long term engine wear due to gas leaking into the oil and possibility of a fire from the un-burned gas. I am working with the dealership who did a software update on 2/07/19 and am waiting to check the oil again, to see if there is oil in it which there definitely was on 2/4, 2/5 when I checked it. Had less than 200 miles on my car before this and now about 230. Called Honda America pre-maturely but will continue to deal with. As a last resort, I will picket the dealership and would like to use the HondaProblems.com article about this to hand out. Would like your approval to so but find it near impossible how to contact you. Any help doing so appreciated. I discovered this issue after about 2000 miles. My dealership changed the oil and said Honda had a solution and it was coming soon. I had another oil change at approx. 4000 miles and then the fix/update performed at 6000. At 9000 miles I had a terrible smell of gasoline in the cabin of my car. I checked the oil and it was diluted and overfilled. My dealership confirmed this but then I was told they could no longer change my oil for free, due to the fact I had already received the update. I was advised to contact Honda corp. I did just that and on my return call she referred to my complaint as "because you did not get a free oil change." I lost my temper a bit after getting nowhere with case manager and being told to "monitor your oil levels often. if you feel it is overfilled you can take it to your dealership for an oil change but it will be your expense." Good grief! I then spoke to my dealership---they have been awesome and are doing all they can to resolve this--I need to be clear on that. the dealership with advise from district service manager then replaced my PCV valve, fuel injectors and all cabin filters. I was cautiously optimistic. After another condescending and terrible conversation with a new case manager at Honda corp, I contacted my dealership again. This time, the Honda case manager told me there is not need to repair, our engineers feel this is normal. I asked why they fixed it the first time if it's normal. I was then told that was NOT a repair but an update to enhance the performance of my car." Unbelievable!! After driving 890 miles after the work done at the dealership, my cabin again had a strong fuel smell as well as my garage after parking. I am waiting to hear back from my service manager. He said he will be in contact with the district rep or will start talking with GM and sales team to get me into a 2019. I am so upset and in disbelief that American Honda is taking this stand when it is obvious there is a problem. I have contacted my state attorney general and have been advise to pursue the lemon law. I have to try arbitration first but am holding off as I don't want to interfere with anything my dealership is trying to do. if I do pursue lemon law etc, I will be asking for a refund on my car, not replacement as I am not sure I can trust Honda any longer. The AC module control was changed...the advisor couldn't explain what this was doing. This was completed and now I have little to no heat in sub-zero temps unless I'm highway driving at least 100 k/h. Temp gauge goes up and drops when slowing down and blows cold air. Brought it to the dealership again and they told me the vehicle is operating as other 2017-2018 CRV's. When I asked what that meant, the service adviser told me they are all having this problem...So in a devious way they're not lying when he said it's operating like all other CRV's. I was told to drive in sport mode...I don't have sport mode, there is a 'second' gear, I've never heard this type of advice just to get heat, they said don't have the fan on full...good luck when it's minus 30 degrees C. The CRV doesn't warm up at all with the remote starter...totally useless option that I paid for. How has this affected the advertised mileage? If these changes have varied the mileage at all Honda needs to rectify this issue as they have not sold the consumer a product as advertised. Everyone needs to complain formally so this issue is addressed...This may be the worse vehicle built in the last 20 years! I brought car into the dealer 3/23/18 with 2534 miles on it. The dipstick showed 3/4 of an inch over full and smelled strongly of gas. I asked the dealer to catch the oil and tell me how much over full it was. I sat down in the lounge to wait for my car....tech comes in and asks me if I had a can to catch the oil in. I told him no....he says he has nothing to put the used oil in....says he's going to go ahead and change it, which he does. They charged me nothing......never made a repair order on it, and said I could go. I asked them what was causing the problem. They replied they had never had anything like that before...knew nothing about the problem which was a bare faced lie! There are 3 other members of my family with this same car, same problem. At this point in time they would not admit an ongoing problem to any of the 4 of us. Update from Mar 6, 2019: brought the car in again 7/30/2018 at 7156 miles. Again it was over full and smelling like gas. I asked that the over full condition be acknowledged on my repair order. It was not. Again, I was charged nothing for the oil and filter change and was told that they have no idea why my engine was full of gas. Update from Mar 6, 2019: returned to the dealership 11/28/2018 at 9822 miles. Again the oil level registered 3/4'' over the full mark. This time the tech did catch the used oil and found there to be 4.6 quarts of oil and gas in the sump without draining the filter. This sump is supposed to hold 3.0 quarts of oil without a filter change. I became aware of the issue this summer. I check the fluids and tire pressure weekly on all our vehicles as a habit (you should too). After the first oil change, I noticed the level rise and took it in. The local (Honda City LI) large dealership claimed I was the first to mention the issue, an obvious company instructed lie. They would only bring the oil to the prescribed level, but my intention was to get the issue logged. It took ~ an hour. Last weekend, I noticed the level was high again. I took it back in Tuesday and was once again told "we're unaware off the issue" BS. This time they mentioned there was a service bulletin. When they were done, they told me they changed the oil (~ 1.5 hrs) but could do nothing else because there was no error code, maybe because I brought it in before there was a crankcase overfill issue in order to prevent future engine failure? They also told me the oil change was a 'one-time' accommodation. So, will I have to risk damaging oil dilution in order to get a fix? That makes no sense! To be fair, the dealership has been fine in dealing with this issue, I get the sense they are hamstrung by Honda. Though we spent a lot of time testing every car in this category and came away thinking the CRV was clearly the best choice, I am now very disappointed in my decision and based on Honda's handling of the issue would strongly advise everyone avoid this vehicle. Delaying the fix will in the end severely shorten engine life and damage the resale value of the vehicle. Even if they eventually fix the issue, so many driving with diluted oil will affect us all. THIS SHOULD ALREADY BE A RECALL FOR ALL '17 AND '18 CRV'S!!!!!! FWIW, we don't do a lot of short trips, extensive idling and the issue started before it became cold. Really disapointed with HONDA. They sold me a beautiful vehicle with a known defect. I only have 300 miles on current oil change and the level is already going up. Not the dealers fault, as they are trying to work with me. Think their excuse of fuel condensing in cylinder wall is bull. We never drive less than 20 miles, so our engine gets warmed up completely. If there is that much fuel getting injected, would expect black smoke and converter fouling soon. Update from Mar 23, 2019: For the record, The "FIX" was installed 1/2/19 at 7285 miles. We are now just over 10K miles and the problem is getting worse!! Oil level still going up, and on top of that, local dealer has lost all credibility. Took the vehicle in to dealer on 3/15/19 for an oil change with only 1800 miles since last change. 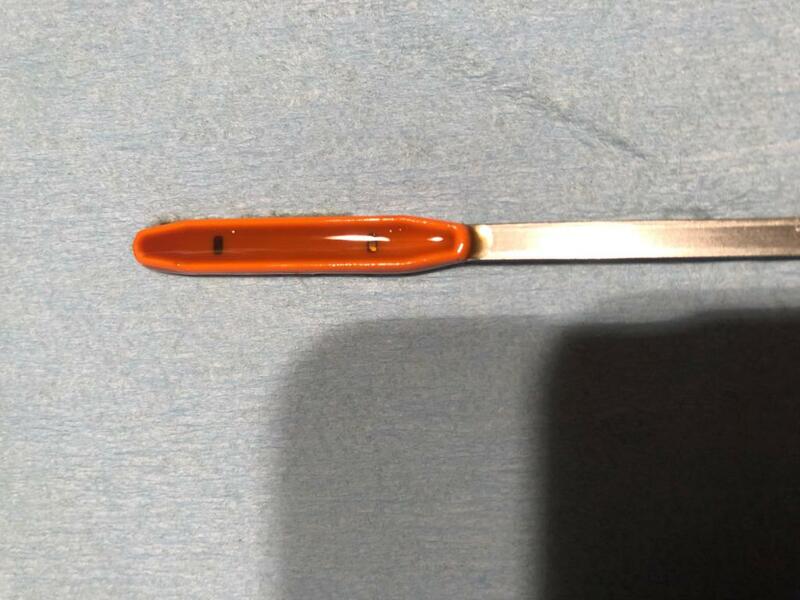 Level on dipstick was above orange plastic tip. After debate with service advisor on how to check level, she decided to change oil at my expense and measure what came out. I agreed. About an hour later service manager came to waiting room with a used 1 gallon oil container with about 3.8 quarts in it. Said that was the oil that came out of my engine. Couldn't explain why I had seen high level on dipstick, but would wave the fees for my inconvenience. Odd thing official service report done by mechanic said he removed 4.6 quarts. Blowing smoke up where?? All this information was sent to Customer Service at Honda to be attached to existing complaint case documents. Got a call from Honda Customer Service on 3/22/19. Was informed Honda engineers say " This amount of oil dilution is normal for that engine, and there are no plans to address the issue", and my case would now be closed. Wow", I was speechless. Save all your documents boys and girls, this is about to get ugly. Will start with the old fashion lemons and the BBB, and work my way up from there. Social Media is a terrible thing to waste. I own a 2018 CR-V AWD EX-L with the 1.5L turbo engine. (ID# 7FARW2H87JE010589) I live in Columbus, Indiana. I purchased the vehicle on February 9, 2018 from Hubler Honda, Columbus, IN. I normally check my own oil along with other fluid levels and items such as tire air pressure. I noticed the oil level being over full in the fall of 2018, at that time we had about 6,000 miles on the vehicle. At 7237 miles I had my first oil change at Hubler on October 15, 2018 (copy of receipt attached). I became aware of the oil dilution issue after receiving a letter from Honda regarding service bulletin 18-114. I checked the oil level and found it to be way over-filled on December 1, 2018 (see AUTOsist note #1 and photo #1 attached). I visited Hubler and they advised that a permanent fix was on its way and I should wait for a formal recall, however I was very concerned about the long term affect on our car’s engine so I returned to Hubler and expressed my displeasure with the delay. They called me a day or two later indicating that they would perform the recall work which was completed on January 8, 2019 (see receipt #2 and photo#2 attached). 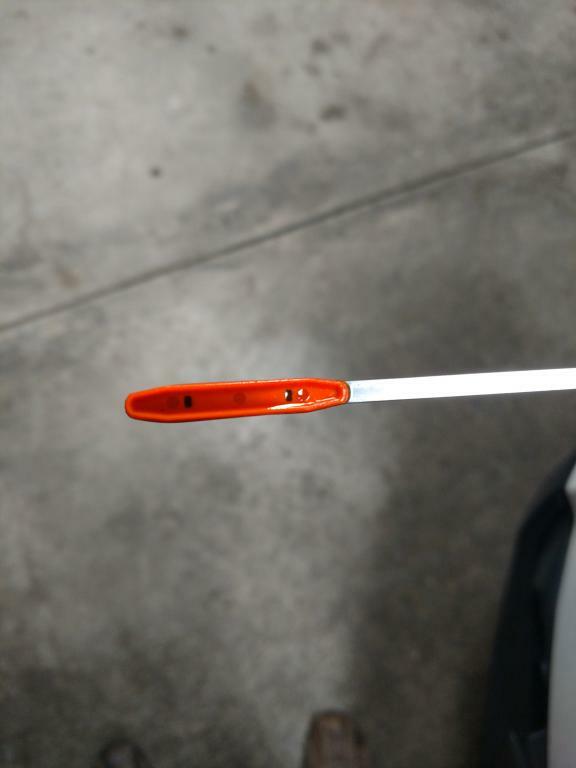 I checked the oil level immediately after the oil change and found it was at the top of the orange plastic tip of the dipstick (I realize the full level is at the top hole in the orange tip). Hoping that the oil dilution issue was fixed, I checked the oil again today, February 15, 2019 after the vehicle sat in the garage all night. The oil level was found to be way above the full mark and beyond the top of the orange tip by more than ½” (see photo #3). The oil dilution issue has not been corrected in my vehicle. I am writing this letter to express my concern and with the impact this matter will have on our vehicle long term. Extending the warranty is not an acceptable solution. I am concerned about the impact of a breakdown while traveling and the subsequent consequences. This is not withstanding the loss of trade-in value that will accompany this vehicle in the future. My issue is not with Hubler Honda, they provided the repairs as suggested by Honda, Inc., after my initial request, but the repair did not work. What is Honda going to do for me now to fix this situation permanently? Please respond. Update from Feb 26, 2019: I received an immediate phone call from Tina, Case Manager at Honda Customer Service, I thought great, Honda was going to respond positively to my concern. WRONG!!! I got a very terse canned statement "there is no concern and no recall. If the check engine light comes on take it to your dealer." When I questioned her, she repeated the same exact response. If a class action suit is happening I want to be included. What I'm seeing now is that the "fix" is a significant increase in rpm right after start up to 1500 rpm and then backing off a little after a few minutes. What that does just dumps more fuel into the cylinders and consequently more blow-by. I think the "fix" just makes the issue worse. I'm going to change the oil, after only 750 miles since Honda changed it, to allow me to sleep at night. I can't in good conscience just let the engine destroy itself. I reported problem to my Hondal dealer with 11K miles on it. They checked and I got their official report: "Costumer states the thermostat go from warm to cold fast and the oil is overflowing and smells like gas in cabin. Found that the oil has normal amount of gas, oil level is normal. Temp gauge is working as it should at this time, At colder temps gauge will drop fast. Everything is working as it should be." I know where you pull stick from oil chamber, this oil smells like gas. Also after being 15 minutes on the road my heat stop working especially when going down the hill, not using gas pedal. I use Mobil one 0W-20. Normal oil capacity is 3.7 quarts; I removed 4.8 quarts. Definitely gasoline smell with the old oil. Very concerned about potential premature wear of the engine. I purchase my new 2018 Honda CR-V in November 2018, not realizing the apparent issues inherent with the vehicle’s engine. Surely had I known at the time I would not have purchased the car. Since December, learning of matters, I have been plugged into various sites and blogs regarding the issues on pretty much a daily basis. My drive to work is approximated 18 miles one way. Today on the travel, with the outside temperature reading 21 degrees on the car’s display, I noticed, for lack of heat, that it took the car about 8 miles to reach normal operating temperature, which is about half way on the gauge. At about 10 miles, a strong odor of gasoline filled the cockpit of the car. Looking down at the temperature gauge, it had fallen to the quarter mark. I consider driving down the road at 40mph and having the car fill will such a strong smell of gasoline a safety hazard and immediately found a spot to pull over, turned off the car, got out, opened the doors to air it out and looked under the hood where the odor remained. The drive is constant and in the country, so there is no reason for the gasoline odor or for the operating temperature drop except for the car itself. I am extremely disappointed and concerned since this seems to be one of the symptoms plaguing the car potentially leading to additional serious issues. I have just over 3000 miles on the car and purchased it because I plan on retiring soon and need dependable transportation when on a fixed income. The only thing that I’ve learned from Honda is an excuse, that it is a cold climate issue and will be addressed in those areas. I live in South Carolina where 21 degrees in the winter is not uncommon and hardly considered a cold weather climate. I demand to know the root cause for the obvious issues with the car and a fix for the long term. Otherwise I want the vehicle replaced with another that doesn’t have an engine associated with these problems or my hard earned money refunded, so that I can look for a vehicle elsewhere. Just like all the other complaints, had the "fix" done by the dealer where they reprogram the car and replace the heater control. Was told this is the fix for the oil/gasoline issue and the poor heat in the cabin. Oil level keeps rising with no change in the rate of increase. Boy do I regret buying this vehicle! Honda will not stand behind their error. As you keep pushing Honda, their response was 1. Never heard of this issue 2. This is normal, Not a problem 3. Honda has addressed the issue. Well, Honda has not addressed the issue because my oil smells like gas and is dark. The oil in the pic shows the oils after several hundred miles. Honda America is downplaying the oil contamination problem. Honda Canada is taking it more serious. I live in Northeast Iowa and it gets very cold here. I am watching the oil level rise and concerned my $30K purchase is being damaged as we drive. I am retired and cannot afford extra repair expenses. Honda needs to man-up and fix this issue ASAP. Iowa is not on the list to be fixed first. Honda has let me down in my last two new cars purchased from them. I had a 2009 Honda Civic Hybrid. The battery design was terrible and was difficult to service. When the batteries started failing, Honda reprogrammed the engines to use the battery less and burn more fuel. Why did I buy a Hybrid? Brand new Honda CRV 2018. Major issues in first 3000 miles. Am shocked by dealer and corporate Honda total apathy. AVOID this motor at all cost. Honda has not been the least reassuring. I am very uneasy about this motor and Honda customer service. Stay clear!!!!! We took our new CRV on a trip to Nashville, TN from Traverse City, MI. The check engine light came on and the oil can icon lit up. I called the Honda dealer where I bought the c rv from and they had no idea what was going on. I got out and checked the oil and found it high. I brought the Honda to a quick lube to check it. They changed the oil then sent me on my way. After arriving back home TC a few weeks later we got a recall letter from Honda. On Wednesday, December 26th, Williams Honda in TC did the recall work. On Thursday my wife got in the vehicle to go shopping and the heater would not work. She called the Honda dealer and brought the Honda to them. They said that they did not cause the heater to not work with the recall repair. After doing something, the heater began to work again. This is very worrisome, we are not sure what to do next. Update from Dec 29, 2018: Update Saturday December 29th, we went for a drive around Traverse City, stopped at the Farmer's Market, visited new car dealerships and returned home and parked it in the garage. During the drive, it took the Honda 45 minutes to warm up so the heater would work properly. It's 22 degrees F in TC. After 45 minutes in the garage I went out and checked the oil level. It was way over full again and smelled like gas. The recall fix obviously did not work.